Tadashi's college friend, and a member of Big Hero 6. Go Go's suit functionality centers around a unique electromagnetic suspension system. "Hope it's learned some new tricks." Go Go Tomago is a character from San Fransokyo in Kingdom Hearts III. She originated in the Disney film Big Hero 6. She is a member of Big Hero 6, alongside Hiro Hamada, Baymax, Wasabi, Honey Lemon, and Fred. On the Golden Gate Bridge, Go Go is knocked unconscious by a mild concussion while fighting Heartless. Baymax and Hiro follow and defeat them. In the city, Sora's Flowmotion inspires Go Go to rethink gravity and apply it to her discs, allowing her to climb up tall buildings. She later uses this while fighting the Heartless, standing upon the walls out of reach while she fights. Go Go appears a young woman of Korean descent with short black hair with streaks of violet, brown eyes, and a curvaceous figure. 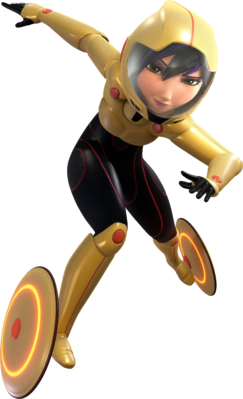 When fighting alongside Big Hero 6, she wears yellow armor with four discs attached to her limbs. These discs allow her to move swiftly on the field like a skater and to attack enemies from a distance. Go Go can be rather edgy and sarcastic, but is quite altruistic, wanting to protect the city. She is usually very serious, calm and mission-oriented. She is a bit quiet and does not talk much. She likes a challenge, such as when she hopes the Darkubes has learned some new tricks. Go Go first appeared in the 2014 Disney animated film Big Hero 6, voiced by Jamie Chung. She is inspired by Leiko Tanaka from Marvel Comics. In the film, it is mentioned that Go Go is merely a nickname given to her by Fred. She is a student of the San Fransokyo Institute of Technology and a friend of Tadashi Hamada. After Tadashi dies in a mysterious fire, GoGo helps Hiro avenge him by pursuing a mysterious thief wearing a kabuki mask who is theorized to have started the fire. This page was last edited on 16 February 2019, at 23:57.